Movement handles included in the Dress. Several textures Included. Foot Pose and Hand Pose also included. 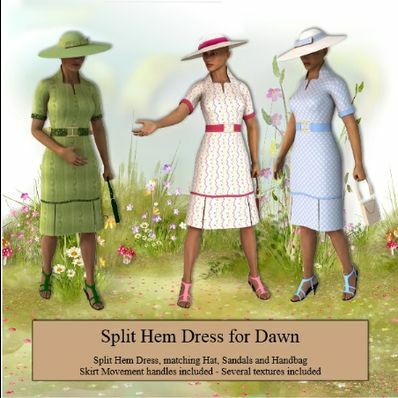 Hat, sandals and handbag are smart propped to Dawn. You may need to adjust hat for hair. wendy, thank you for creating so many wonderful freebies! I have always admired your work, especially the "period costumes", and it makes me sad to hear that people have been bugging you with requests. you should always make the things that make you happy! Looks great. Thank you for sharing all the frebies. Wow! Thank you. This will be great. Wendy, Thanks for all of your wonderful freebies! They are all very appreciated!